Welcome to the Paper Pumpkin Possibilities Blog Hop! We are all fans of this monthly crafting kit and want to share with you our enthusiasm for this box of fun and creativity. The beauty of the Paper Pumpkin kit is that you can follow the directions provided in the kit and make the projects as they were designed or use the supplies as a starting point and let your creativity run wild. On this hop we will be sharing lots of ideas with you on how to use this March Paper Pumpkin kit: "Poppin Birthday". This kit makes 8 cards with pop out images and here's my alternate project. If you love Pop-up cards,then this is the kit for you! Checkout these super cute cards with a Pop! Are you currently a Paper Pumpkin subscriber? If not, now is a great time to join in the fun, especially during Sale-a-bration! Sale-a-bration is the only time of year you can receive extra free product for purchasing a 3, 6 or 12 month pre-paid subscription. Contact your demonstrator to get started or CLICK HERE* to subscribe by March 31st to get this great offer! In April, Paper Pumpkin we have something entirely new: Distinktive stamping. Distinktive stamps give you photo-realistic images with just one stamp, the result is breathtaking. Subscribe by April 10th and get this kit with 9 cards and an adorable gift box. Thank you for joining us as we share with you the possibilities of paper pumpkin, now hop over to Shirley's blog to see her cute creation. March 31st and get $175 worth of Stampin Up product for $99. Great card, Charmane! I like how you used the pop-up from the inside for the front! Clever idea to use the inside pop up on the front of the card. It looks great! Fun card, and you didn't forget the envelope! Thanks Debbi, I love decorating the envelopes. Super cute card! Thanks for hopping with us and sharing such an amazing idea! 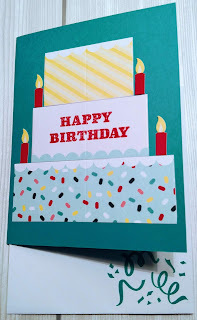 Adorable card and love the candles on the side!